I grew up knowing there are two seasons in the Philippines: a dry season and a wet season. So I was surprised when my friends at Google informed me that there are actually three seasons: (hmm my Social Studies teacher taught me only 2 lol! ): the Hot Season (tag-init) from March to May, the Rainy Season (tag-ulan) from June to November and the Cold Season (tag-lamig) from December to February. I don't know when or how they changed it but three seasons absolutely made perfect sense to me. As I am writing this post, I get a phone call from my brother and Mama in Tuguegarao, my hometown in the Northern Philippines. I can hear the thunder in the background, and they tell me that it has been raining continuously for the past several days, as they are in the midst of the rainy season. It has been raining over here in STL too and indeed, this was fortuitous as I had prepared a dish we loved to eat during the rainy days when we were kids. 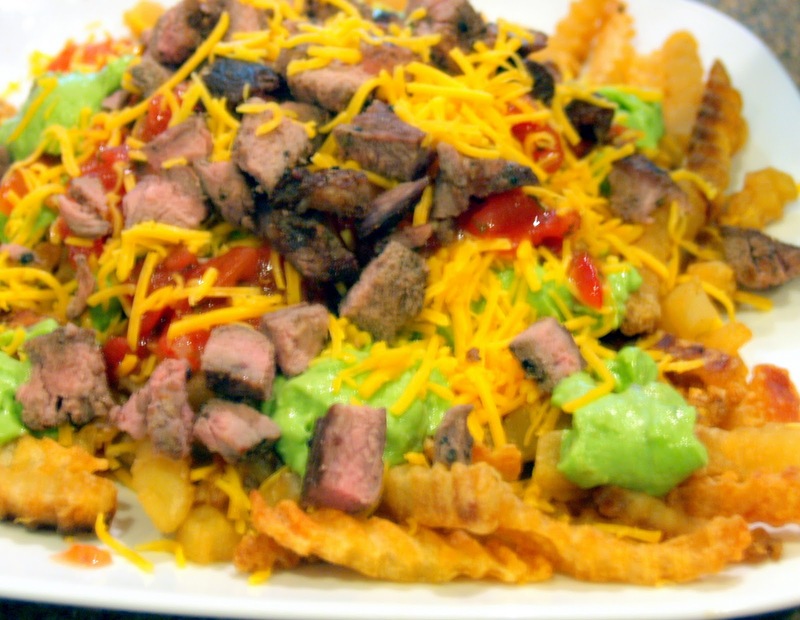 I can recreate this dish as perfectly as I can remember, well except for the full smoky flavor. This is because back home, the electricity would always go out during severe thunderstorms and we would cook the dish on a clay oven (a pugon) over a wood fire. 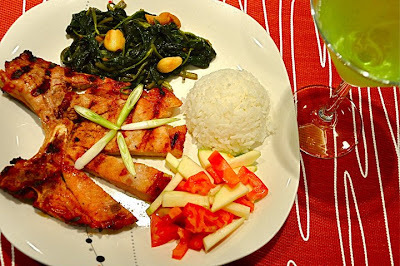 Using a pugon is the traditional way of cooking and the flavor it imparts on the dish is indelible. 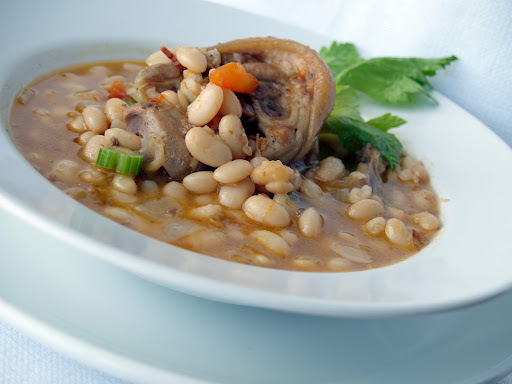 My brother also feel nostalgic, remembering enjoying habichuelas (white beans with pork hocks) on those cold rainy days. 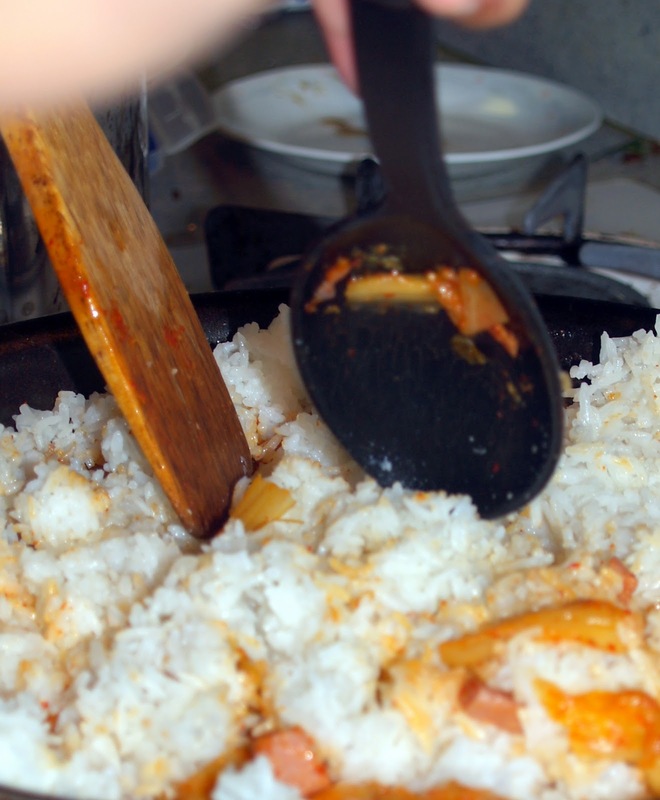 There is a Latino food version of habichuelas, like the popular Puerto Rican dish Arroz con Habichuelas (rice and red or pink beans). 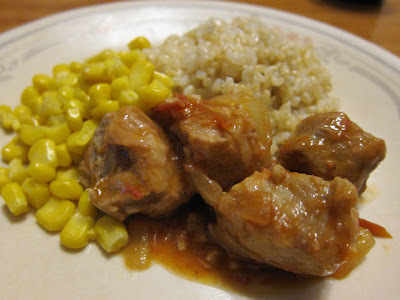 The Filipino habichuelas, or at least my version, is similar to pork and beans but is more of a stew. 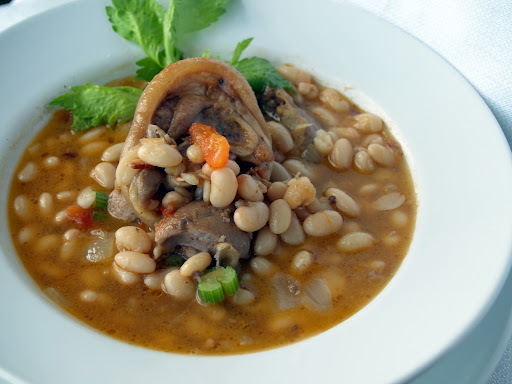 I use fresh tomatoes, pork hocks and white beans. To capture the smoky flavor, I saute the pork with fat-rendered from frying smoked bacon. 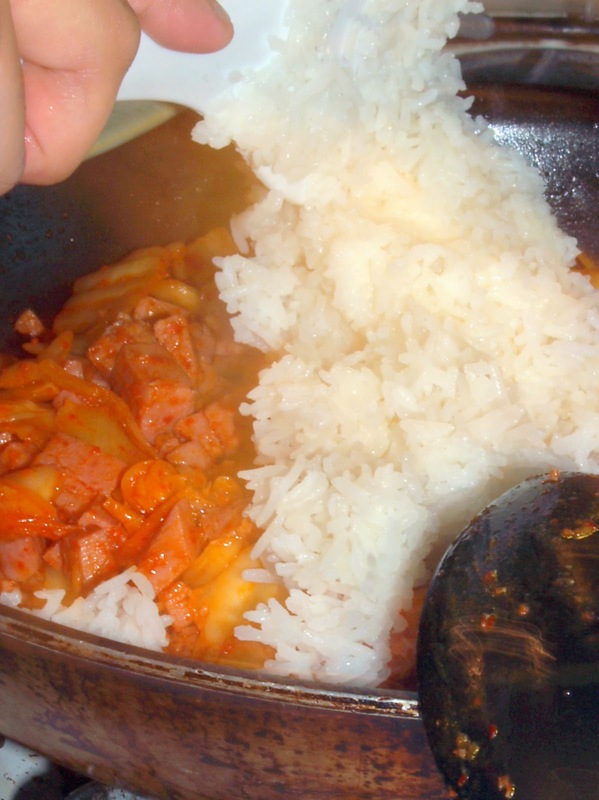 My first bite immediately transports me back to my hometown, I remember the rainy days with my family, huddling over the dining table enjoying this warm dish with piping hot white steamed rice. As mentioned it's been raining here in St. Louis and I have been cooking this at least once a week. So I will show you both ways of how to cook it. Either or, it works both ways. 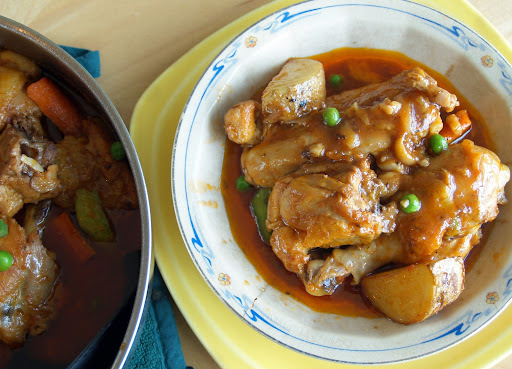 Also you could use pork belly as an alternative to pork hocks, both make thicker, sticky stew. It's super easy, it just needs preparation especially with the first method. But it's well worth it as it hits the spot especially on a chilly, rainy day! Soak the beans overnight and refrigerate. Strain the beans and give it a quick rinse. 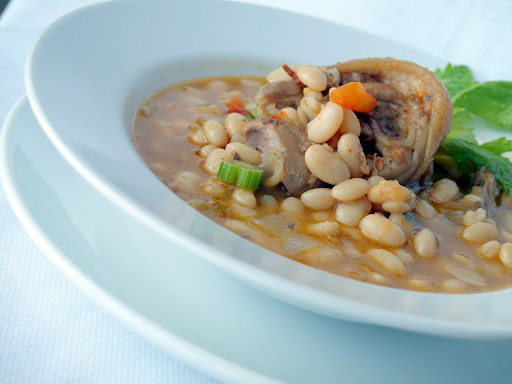 On a stock pot, put the beans and pork hocks, add water just enough to submerge the beans and pork. Bring it to boil until the beans and pork are tender. On a different pan, saute garlic and onions with the fat rendered from smoked bacon. When onions are translucent, add tomatoes. 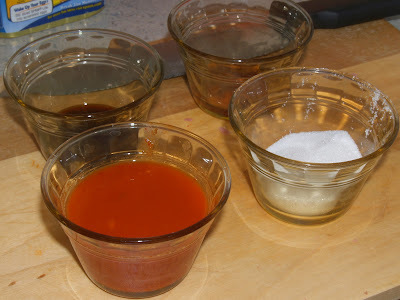 Stir and press the tomatoes into the pan, til tomatoes get wilted and soft and turning into almost like pureed. Add celery stalks. Now add the pork and beans into the pan. 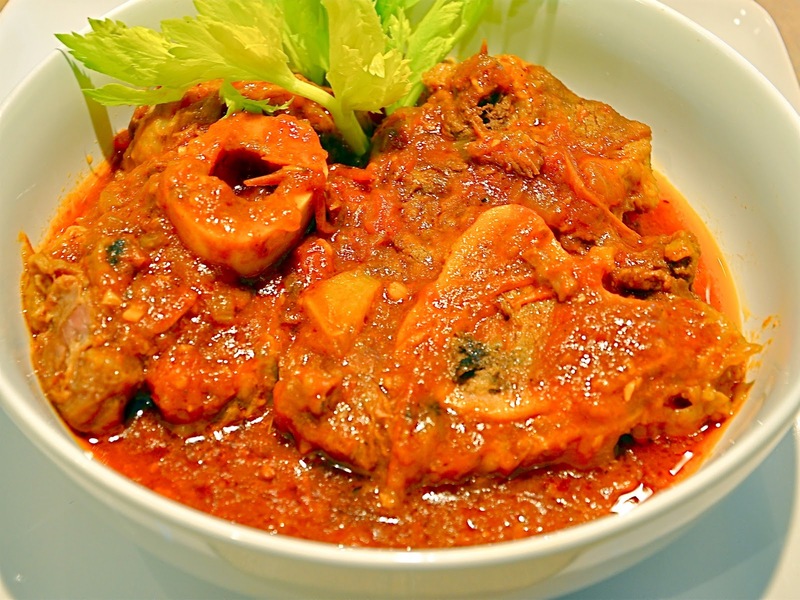 At this point, you may also add more soup stock, Let it simmer until you have a thicker, sticky stew of beans and pork. Now for the second method. You may omit the soaking of the beans. You could also reverse the method by sauteing the garlic and onions until translucent. Add tomatoes and press it into the pan until it gets wilted and soft. Add pork hocks, bay leaf, then sprinkle some black pepper. Mix it altogether until pork turns a little brown. Add the beans and add soup stock. Let it boil until meat and beans are tender. Season with salt and pepper and you have a bowl ready to soothe you in this cold, rainy day... Enjoy! You might think that having three kids in college makes me a pro in sending care packages, right? But if you ask my kids they would say no, I'm not an expert. Care packages come far and few between. Although when I took my son to NY at the start of the semester, things changed a bit. The idea of him on the East Coast while we were on the West Coast (this was before we moved to STL) made me realize that I should bridge the long distance. And sending care packages was the way to go. Ok, maybe I over did it because as soon as I deplaned that day, (coming from NY) I went straight to the post office and sent him a box full of stuff from home. Oh my you should have seen how my girls reacted... haha! No, I'm not playing favorites (hmmm do I see eyebrows raising?) But in my defense both of my girls live within driving distance... so seeing them or being with them is easy. And the thought of them being near made me neglect the "mom-sending-care-packages" part. Now that we live in the Midwest, I have to make sure that I send to all three of them, no more excuses haha! I'm progressing quite well. And the best part of it is hearing my son say: " Mom I was surprised to see the box with my name on it. It felt like Christmas opening the box!" 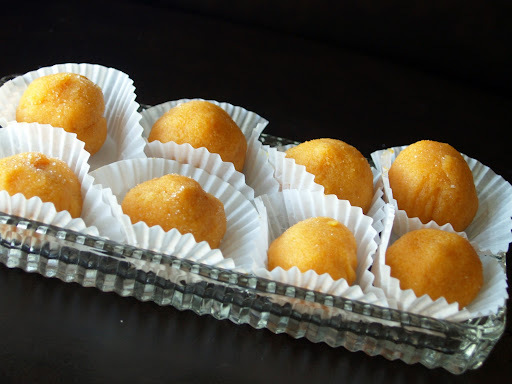 Yema is a sweet treat popular in the Philippines. 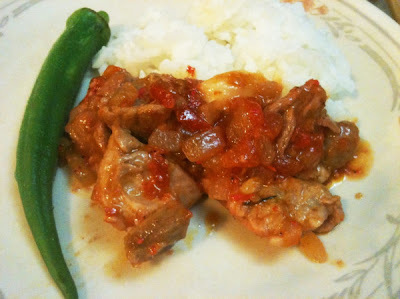 I found this recipe from Asia Recipe online which added mashed potatoes in their recipe. That gave me the idea that it will work with pumpkin too. Verdict? 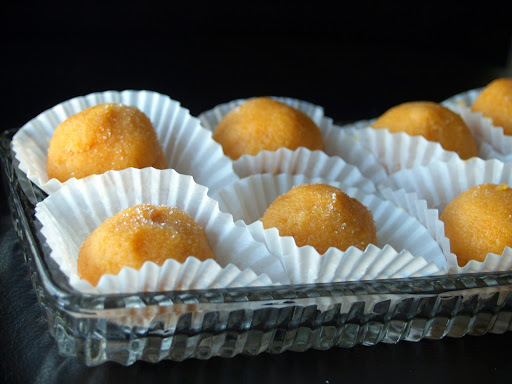 I'm afraid I have nothing left to mail anymore as the yema balls disappeared faster than I could make them. LOL! Combine all the ingredients. Mix thoroughly. Cook in a double boiler. Continue stirring until it thickens. It took me about 25 minutes. Let it cool. I actually put it in the fridge overnight. Roll into balls. 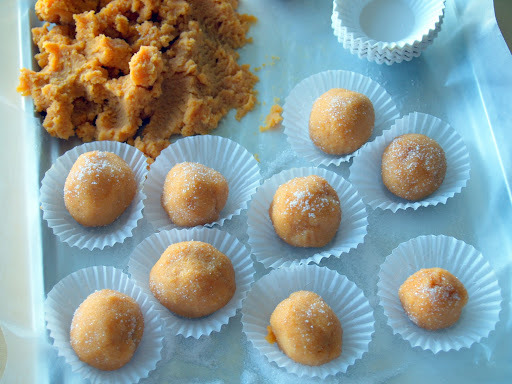 Sprinkle sugar to lightly coat the yema balls. I found this list online you know you're old when... and was laughing hysterically. What made me laugh harder was that some of the things listed here apply to me. Oh my, am I that old? haha! I could add more to the list, like for instance you know you're getting old when you go out on a Friday night with your husband to go grocery shopping. What's even worse is that your idea of a date is breakfast on a Saturday morning and you line up (with other people--- well older people) waiting for the cafe to open... LOL! It's great to have a sense of humor especially when you've been with someone for a long time. I think it helps that sometimes we should not take ourselves too seriously. Amidst all the stresses, the arguments and the disagreements, laughing it off until your belly aches makes a difference in a marriage. "Love, buy the chicken quarters it's on sale, make some chicken afritada." 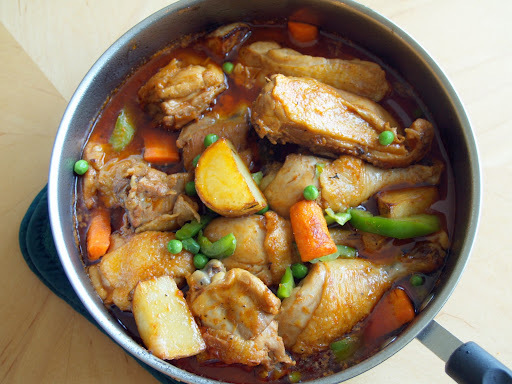 And you make the chicken afritada... and cook it as best as you could... as rustic as it could get, for him to know that you look forward to growing old with him...TWOgether! In a pan, brown the potatoes and carrots. Set aside. In the same pan, brown the chicken cutlets, set aside. Sautee garlic and onions, put back the chicken cutlets. 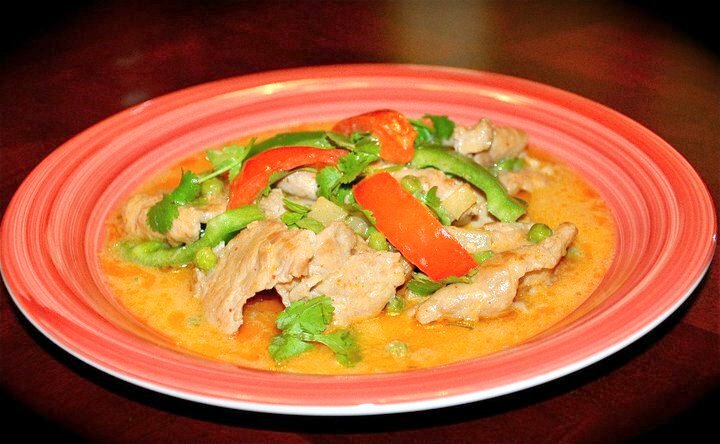 Stir the chicken, add a dash of pepper and 2-3 bay leaves. Pour the tomato sauce into the pan. Make sure to deglaze the pan and get those brown bits add the soy and lemon marination. Let it simmer for about 20 minutes. Add chicken stock and cook some more. Add the potatoes and carrots. 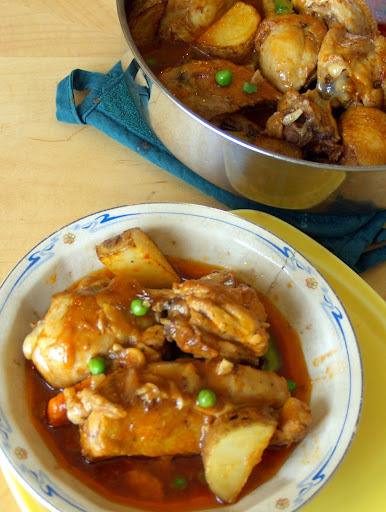 Let it simmer then add the remaining ingredients such as green peas and green bell peppers. 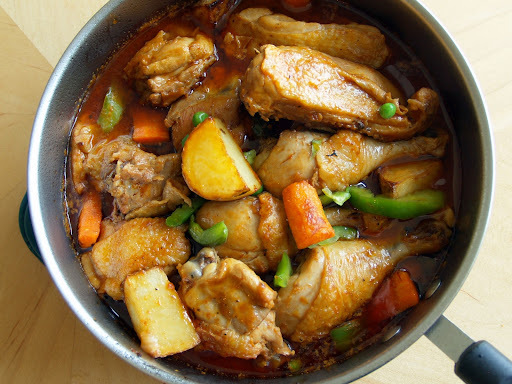 Simmer until the veggies and potatoes are cooked. Serve with steaming hot rice... and enjoy! Oh yes, it's carne asada fries baby!!! Yes and with ice cold cerveza made my husband cheer louder (and we're glad my son was not around to hear us cheer for the Cardinals). Never mind if the Cardinals lost last night, (we're confident they will rally back and Pujols flicks another homer) but this plate was a sure winner! 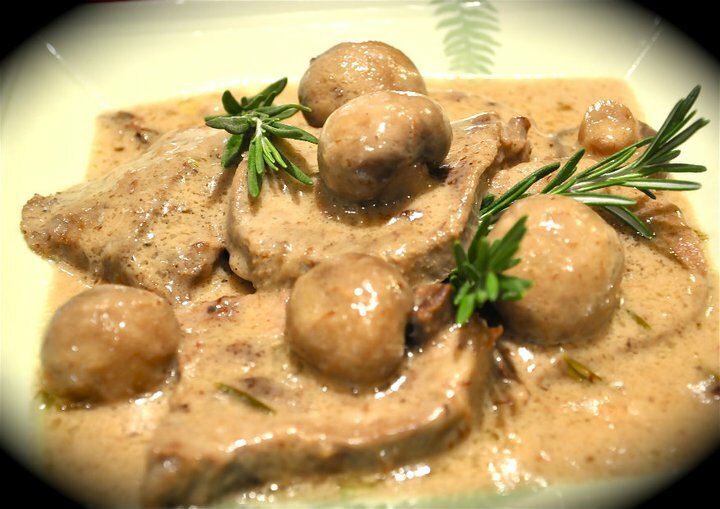 I was hesitant to share this recipe since I didn't do any cooking. But with the rave that this plate got, I gotta post it. I just baked some store bought fries. 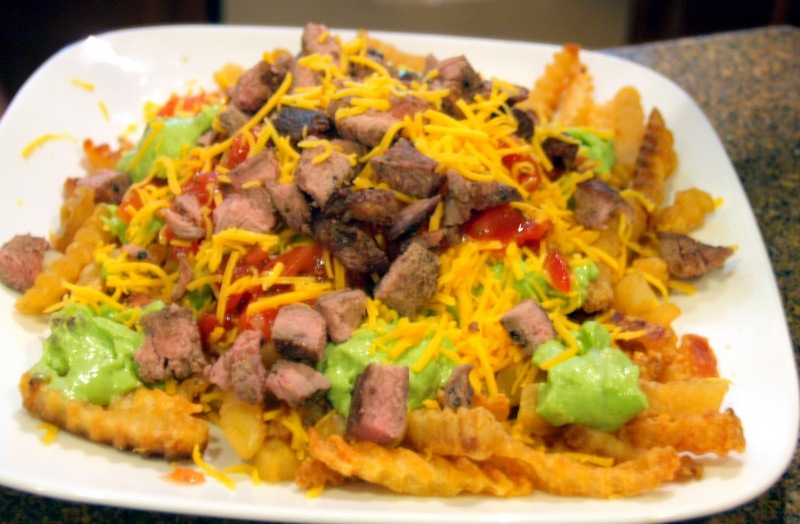 Cut some left over carne asada steak (recipe below), layered it with guacamole, salsa and cheddar cheese. plate it and voila, you have a home run! Prepare your grill. Remove beef from marinade. Grill over hot flame for about 5 minutes or until it's browned. Turn it over and grill the other side until desired doneness. Let is rest on a board and slice. Should be served while still hot. I didn't realize that it's been two years since I started blogging. I started off writing as the Impromptu Diva and posted my very first post on October 2009. My first few posts didn't even have photos... can you believe that? Then I renamed my blog Skip to Malou and it has evolved to what it is now. It's been an exciting journey to say the least. Blogging has become an obsession (just ask my husband) and it has helped me chronicle my cooking expeditions and the simple things that bring joy to my heart, mostly stories of my family and friends. Blogging has paved the way to forging new friendships and rekindling old ones. Thank you to all of you for always coming back here for my recipes and my stories. I am truly grateful to know that you are here with me on my journey the last 2 years. I truly appreciate the comments you have given, the emails you've sent, and even if you are a silent follower, thank you for reading my blog. I want to thank one of my loyal followers, Medy C. She's the wife of my high school classmate and our friendship developed through Skip to Malou. She is one of my closest friends on Facebook (just check the "likes" and comments we exchange) and she has tried a lot of my recipes. Medy finds joy in preparing meals for her husband and daughter, and she's doing an excellent job. I have to admit, I'm thrilled to have a friend and blog follower like her. 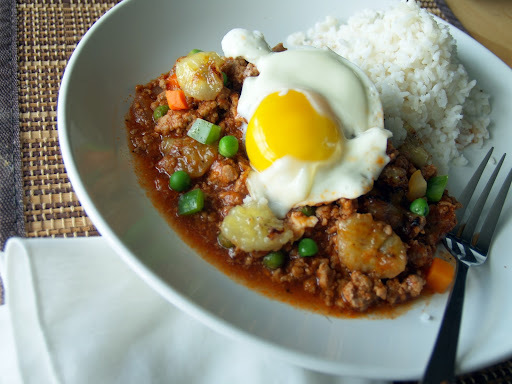 The best compliment I receive is when my readers recreate my own twist on Filipino food recipes. Thank you Medy for being there... and for the friendship. 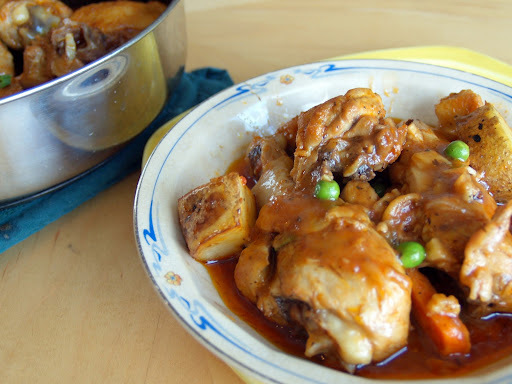 According to Medy, this is her daughter's favorite, a recipe I called Adobo Chicken Delight. Rodney loved the dish a lot that he had it 3 straight days. Looking forward to receiving more pictures from you. Have a great weekend everyone! My daughter promised to guest blog... well that was the plan but then again school, work and yes life got in the way. So I was writing my post this morning when I came across a folder in my file called GUEST BLOG. Curious, I opened the file and I saw pictures of my daughter in my kitchen! Oh my, I thought, she really intended to guest blog! And so I'm foregoing my scheduled post today to feature my daughter's guest post... well kind of guest post. (Heather you still have to write me another one just as you promised right?). I'm sure you don't mind that I'm posting yet another rice recipe topped with fried egg just like my previous post.. right? I hope the answer is yes haha. 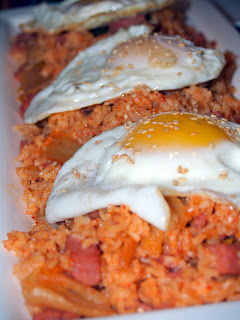 So let me share with you the steps on how to make Kimchi Fried Rice as revealed by the photos I found. I found it amusing that she prepared her ingredients in those tiny cups hehehe.. So for ingredients she used: She used SPAM and cubed it. (When you're in college, Spam is your best friend) 2 tbsp vegetable oil, garlic, onions, Kimchi marinade (she squeezed the kimchi to get its juices out) salt (oh my that 's a lot of salt but sue it in caution as the spam is already salty). In a pan, saute garlic and onions. 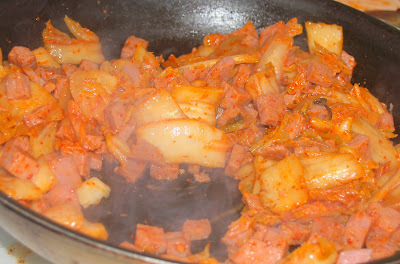 Add spam cubes, kimchi cabbage. Add soy sauce and kimchi sauce. She used around 3 cups. Mix them together...and you may add more kimchi sauce to get a well coated plateful of rice... top it with fried eggs... and enjoy! This was the first time kimchi fried rice was served at home... and it was actually the start of kimchi fried rice obsession. The flavors will explode in your mouth... as in literally because of the heat... Happy cooking! 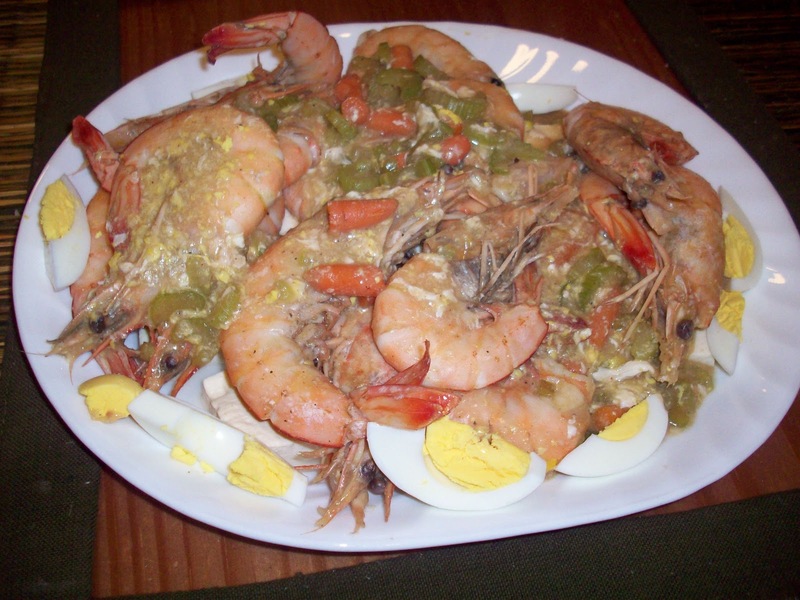 Quite frankly, it baffles me where the name of this dish comes from. 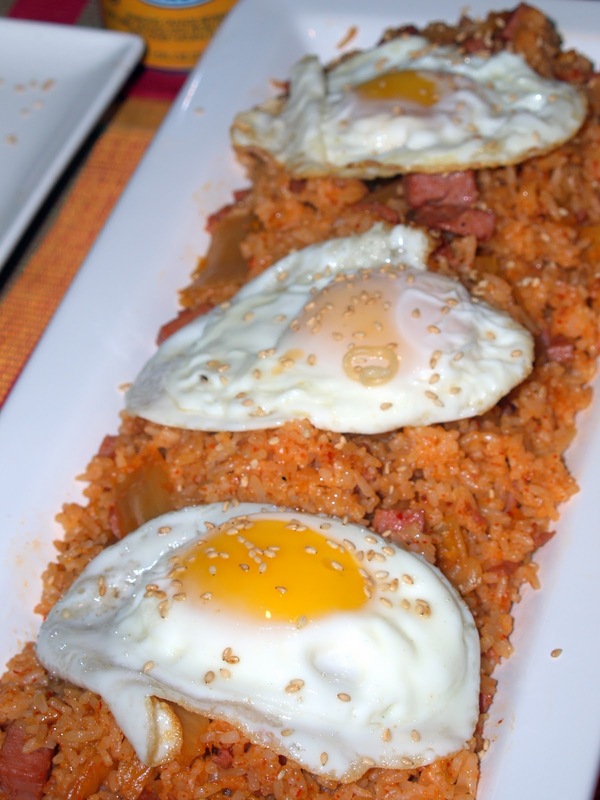 Arroz A la Cubana, or Cuban-style rice somehow reached the Philippines. 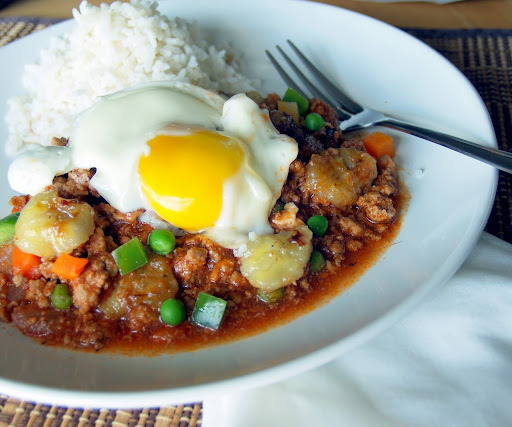 This is a Spanish dish, but our version in the Philippines is composed of white rice served with ground beef sauteed in onions, garlic, potatoes, carrots, raisins, tomato sauce and topped with a fried egg and fried plantain. My friends at Wikepedia and Google helped me with the English translation of the name and informed me that Peru has a similar dish, also served with a fried banana. (If you have better answers than my Wiki and Google friends, I would love for you to enlighten me). I learned to love this dish since this is a simple dish to prepare but it offers comfort in every bite. Its flavors reveal themselves in your mouth. The sweetness coming from the fried plantains and the raisins. The tangy flavor comes from the tomatoes, and along with the texture of the ground beef, it sings like a symphony in your mouth. 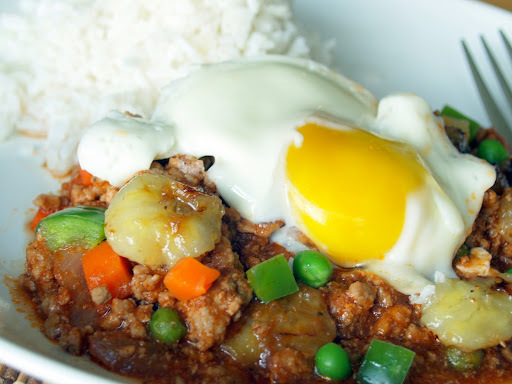 All the flavors are held together by breaking the fried egg and having the yolk coat the ground beef. 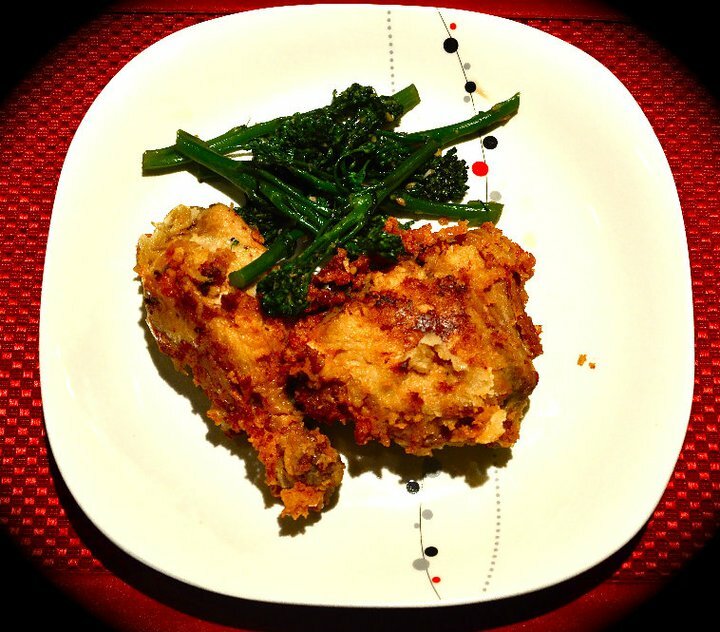 Each time I serve this dish brings my family to a chorus of WOW and YUM notes...(in different ranges-- haha!) Little did they know that this is quick and easy to prepare. I am sharing it with you since I am sure you and your family will enjoy it too...and chances are you might hear them sing a sweet melody of WOW! Happy cooking! Saute garlic and onions until soft and fragrant. Add the ground beef. Give it a quick stir. Add pepper and bay leaf. Cook until almost dry. Add tomato sauce and continue to cook for about 10 minutes. 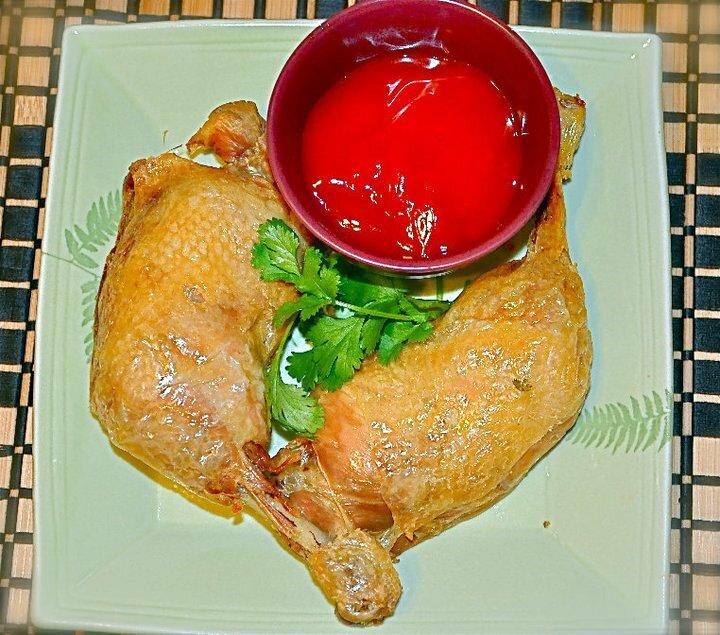 Season with oyster sauce and soy sauce. (oyster sauce? how could this be authentic you might ask -- but hey it perks up the flavor and works well). Add carrots, pepper and green peas. Throw in some raisins. Top it with fried bananas and a sunny side up egg. Enjoy with some arroz... and oh btw, you could reduce the sauce further til almost dry. My family just loves it a little saucy. As a kid, I remember playing in the yard and the streets with my siblings and cousins. I hid myself strategically in Hide and Seek, I called "madaya" (not fair) when my big cousins wrestled me around Cops and Robbers, I cried when my brothers didn't want me to join them playing basketball or baseball (well using socks as a ball). And I remember hopscotch and Jack stones were some of our favorites. We did not have video games and kids tv shows back then and it was all normal for us to be running around and playing with our friends and cousins in our neighborhood. Call me old fashion but I still would like to see kids running outside, laughing and giggling, sweating, with dirt on their clothes and even having a few scratches here and there. That's the kind of playing I grew up with... and when I reminisce about those days, it never fails to rekindle happy thoughts, warm smiles and fun memories. Indeed, playing at home or in school or with friends has a lot of benefits: it builds a happy family, warm and lasting relationships, and fond memories we carry through the years. It sparks imagination, develops confidence and builds social skills. So it was a delight when my sister-in-law Sigrid and my brother Paul came up with the idea of putting up Play Universal, a social enterprise that creates opportunities for kids to play. They've been planning this for a year now and I am excited that their initial project is promising to be a successful one. On October 21 - 23, 2011 they will hold the first festival on children's play in Manila called Play Pilipinas. This is the first on its kind held in the Philippines. Their dream of promoting play as an integral part of development has snowballed into this big event. Established educational and business institutions have joined them in this endeavor. 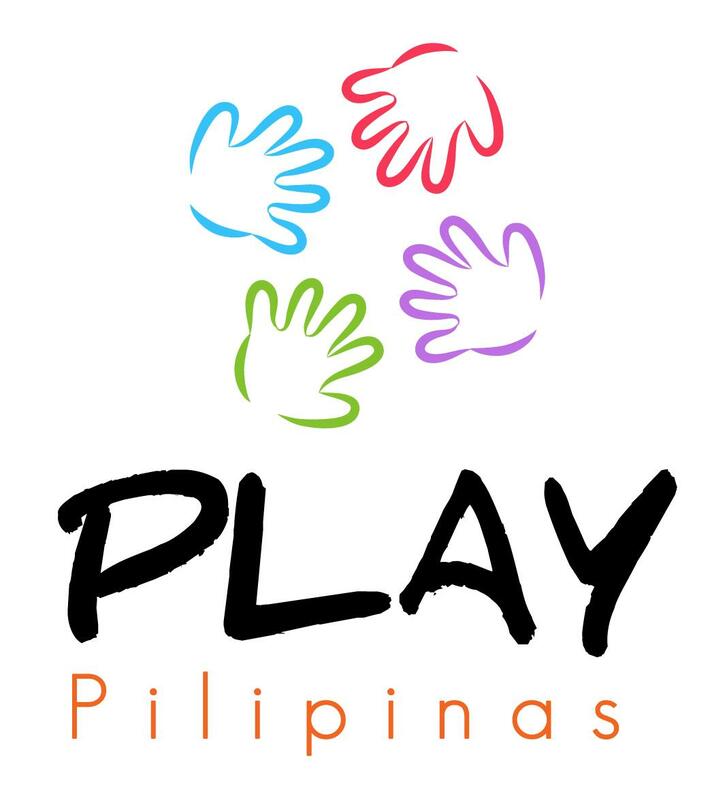 Speakers from all over the world are flying into Manila to talk about importance of play. Of course since its a festival about play, there will be a lot of fun involved. Being the foodie that I am, I was fascinated with the workshop called Kitchen Playtime. This will be hosted by a local TV food show host, Nancy Lumen Reyes. And how fun could it be to do Chocolate finger painting, noodle art, the chemistry of popcorn and even the popular dish adobo. Ahh it makes me want to be a kid all over again. Well don't we all wish we were kids again? Because as kids all we want to think about is PLAY! But then again, as Plato said: "Life must be lived as PLAY". It's time we take play seriously... LOL! To Paul and Sigrid, good luck on your first venture! May your kids continue to play like we used to and enjoy every minute of it. Guest Post Wednesdays is my way of showcasing non-bloggers who are passionate about food. However, when a fellow blogger, Elizabeth, told me that she'd write a guest post for me, how can I say no to the Queen? Yes folks she's called the Mango Queen on Twitter and she has two blogs, one of which is called Queen's Notebook and the other is Asian in America. Yes two blogs! I don't know how she does it, but I guess when you are passionate about cooking and blogging, it's not enough to have just one. 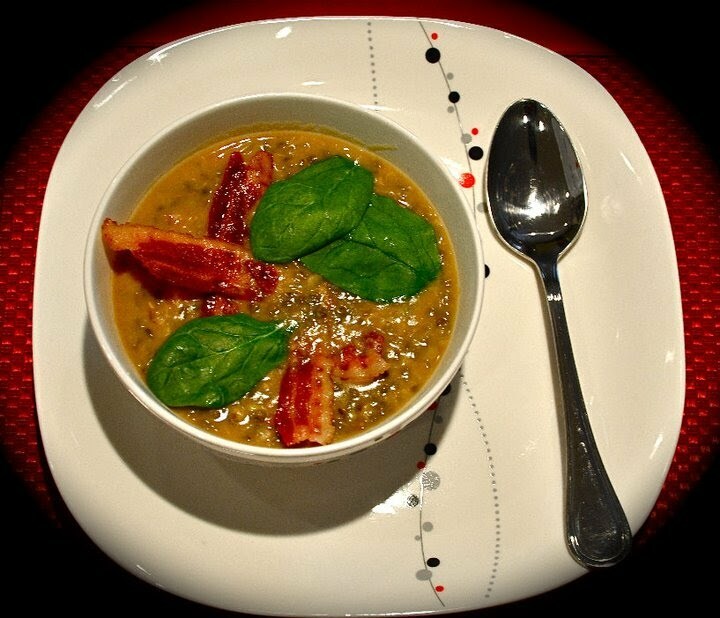 And passion for food is one of my criteria for my Guest Posts. I hope you check out her blogs and support her. And you will definitely see how much love she puts in towards her posts. So without much ado, folks let's welcome Elizabeth. When a new family moves in the neighborhood, I like to go welcome them. I know what it’s like to be the new kid on the block. It’s never easy to move and sometimes takes a while to make friends. 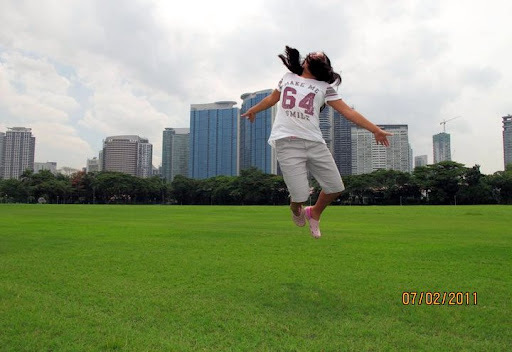 One of my good blogger friends, Malou moved from California to St. Louis,MO recently. From her tweets, she’s still unpacking and going through her stuff. Malou was so helpful to me in the past year, gave me great recipe ideas, tips and even introduced me to other foodie friends. Malou’s friendship and support was invaluable. And if I lived closer to her, I’d lead the Welcome Wagon to say hello to Malou. 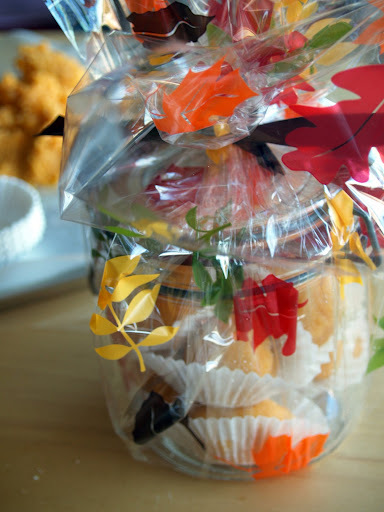 As a gift, I’d bring her one of my signature baked goodies, too! I’ve baked “Lenguas de Gato” (translated as Cat’s Tongues) for friends. 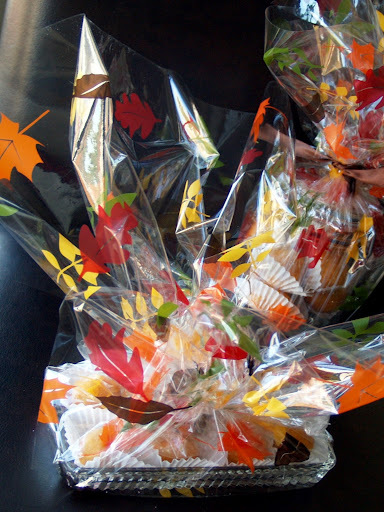 I’ve baked them since I was in high school and gave them as gifts. The “Lenguas” are oval shaped thin slivers of butter cookies. 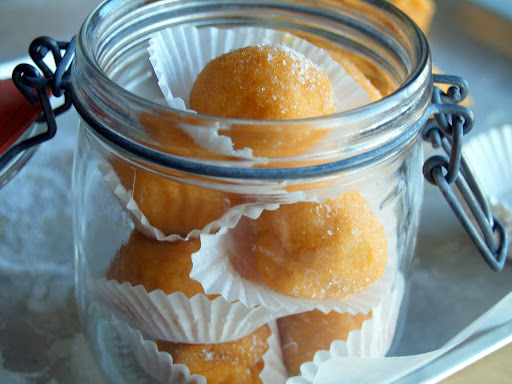 They are tiny , but oh wow, are they packed with rich, buttery and creamy flavors. My version for Malou is infused with “ube” or purple yam. It is a favorite flavor in Filipino desserts. Ube is a root crop, that’s pink on the inside, and belongs to the same family as the potato, but tastes sweeter. Predominantly found in the Philippines, India, and other Asian countries, the “ube” is often used as a main ingredient for desserts or snacks. 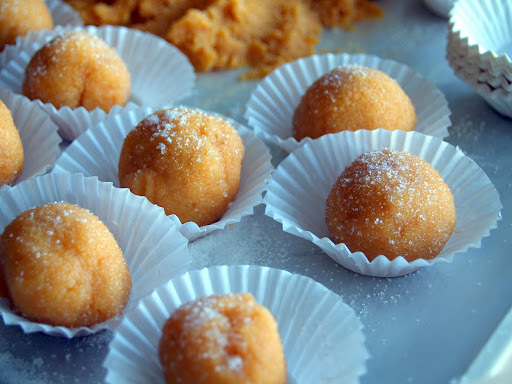 “Lenguas” are a cookie staple in Filipino groceries and bakeries. They are usually packaged in a round plastic jar, with its signature yellow cap. Its rich, buttery flavors appeal to many who love sweets. To make these LENGUAS different, I added ube flavors, while I folded the cookie batter. When they came out of the oven the aroma was so inviting….rich, butter-like, and the smell of sweet ube floated around the house. So here are my LENGUAS DE UBE for Malou….I’m sure she’s unpacked her tea and cups and will definitely enjoy these buttery-ube treats. Welcome to your new home, Malou ! 1. Using an electric mixer, at high speed beat the eggwhites with the cream of tartar, till soft peaks form. Set aside. 2. In a separate bowl, sift together the flour, baking powder and salt. Set aside. 3. In another mixing bowl, using different mixer whisks, cream softened butter and sugar. Add one whole egg. 4. Slowly blend in the dry ingredients. Add the vanilla. Then add the ube flavor and color. 5. Carefully fold in the beaten egg whites by hand, till all ingredients are totally incorporated. 6. 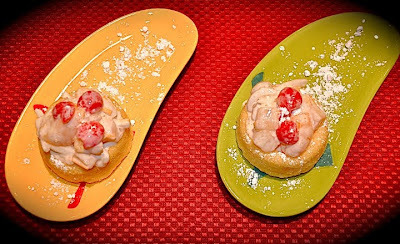 Put the cookie batter in a pastry bag, and on a cookie tray lined with parchment paper, form 2-inch long, pencil-thin shapes. 7. Bake at 375 degrees for 6 minutes. Cookies are done when the edges turn slightly brown. Be careful they do not burn. 8. Remove “LENGUAS de UBE” from tray, and cool on cookie rack. 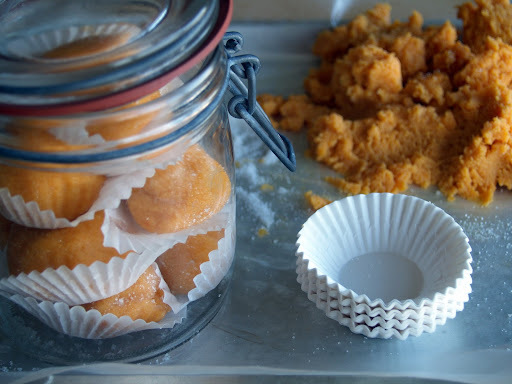 When they have cooled completely, store in air-tight containers to maintain crispness. 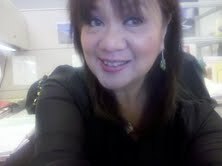 Thank you so much Betty Ann for gracing my blog. It was so sweet of you to think of me with the recent move that we made. These cuties are like smiles that warm up my heart. It's so comforting that you are there with me (albeit virtually) going through this process. Now will I expect these lenguas in the mail then??? LOL! But kidding aside, I truly appreciate the kindness and the thoughtfulness this post brings.... Here's to blogging... Cheers! Living near Forest Park has allowed me to take walks around the park almost daily. The different colors of the season are slowly revealing themselves in different shades of yellow, orange and red. This lifts me up and fills my head with wonderful thoughts and memories. After living in FL and CA for the past ten years, it's been awhile since I've been surrounded by the splendor of Autumn. And I've Fall-in love! My family's brief stint in New York gave us our first glimpse of Autumn and that feeling is all coming back to me. And it's funny that even while walking,(when the body is supposed to be burning calories) food randomly pops up among my fondest memories. Food paraded in my mind as I thought about each state I lived in, New York: Italian Sausage, Florida: Pad Thai and So Cal... hmm I haven't really associated a single dish to Socal's myriad eats. 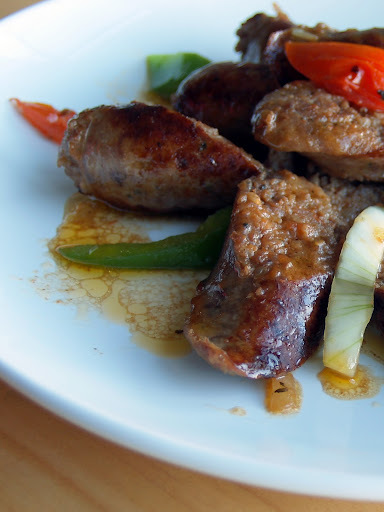 Ok, for now let's talk about New York and the recipe for Italian Sausage from my father in law, Papa Tony. In retrospect, Papa Tony is the orginal foodie in the family. He is our Masterchef and I served as his sous chef during our cookfests at home. 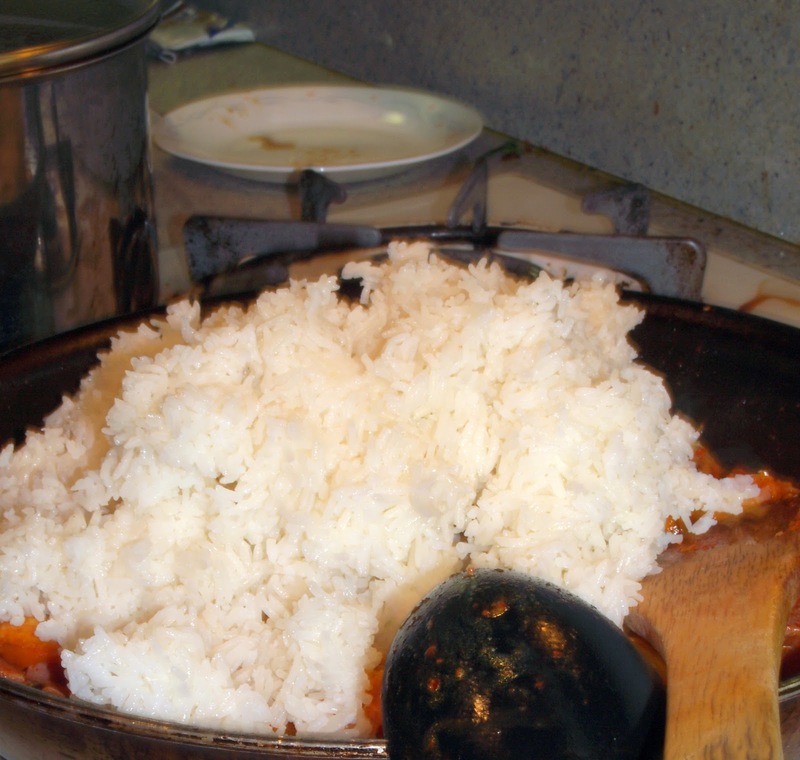 Because of our constant cooking, I was exposed to different techniques which I believed made me more confident in the kitchen. He introduced me to a wide array of various cuisines with interesting notes on each cuisine... plus he has an elaborate knowledge of the things he enjoys like photography and astronomy. So while we cook he would share his knowledge like you're reading National Geographic or watching the History Channel. 1. On slicing veggies: Make sure that all slices will yield uniform sizes, resulting in diagonal slices. This may be done for appearance and to allow even cooking. 2. 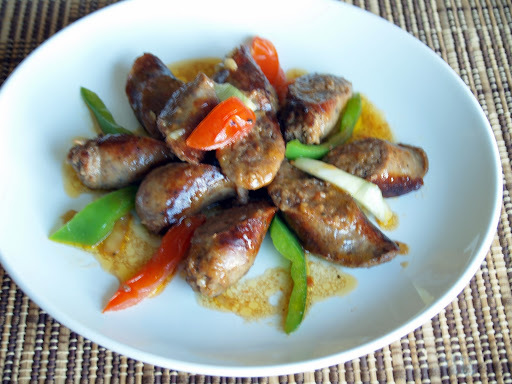 On browning sausages: Add minimal oil to the pan, just a thin coat in order to brown your sausages. This is an important step in your flavor-building process. 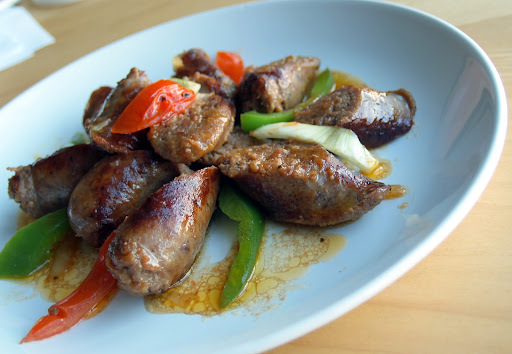 The surface of the sausage should be dark brown and a little crusty not burnt. So keep those tips in mind as I share with your Papa Tony's recipe. In a pan, brown sausage links on each side. (Make sure to follow Papa Tony's tip #2) It may take about 4 minutes each side. Set aside. Using the same pan, saute garlic and onions. Stir and add tomatoes. Add white wine. Let it simmer. Slice the sausages and bring it back to the pan. Pour in broth and cook the sausages for about 5 minutes or until the sauce is reduced. I got a call from Papa Tony, and he said that I should add more broth (bouillon dissolved in water is fine too) to the sauce... and also add more onions.... thanks Papa!